Late bloomer. 5 pale petals with 3 scallops each, soft fuzzy leaves. Flowers open in late afternoon, close next morning. Notes: Aster (Sunflower) Family, Tarweed tribe. Bracts of flowers look like ‘bunny tails’ i.e. 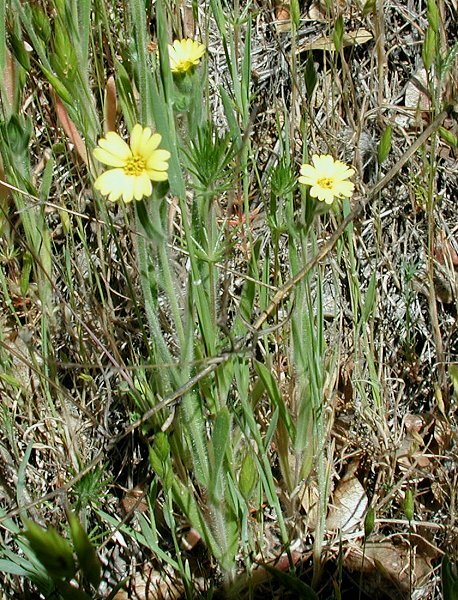 “rabbit-tail-like bracts.” Has white hairs on leaves and yellow-stalked glands. Flower heads open late in the afternoon and close next mid-morning.